As a municipal agency dedicated to equity, the Human Rights Commission exists for the community and is deeply committed to the dialogue between community and local government. Below are recent highlights from HRC events, hosted to listen; amplify unheard voices; inspire connections between community and local government; advance equity in education, nonprofits, technology, and other vital fields; train service providers; and carry forward the HRC's mission to protect and promote human rights for all people. For more community events, subscribe to our Google Calendar above or check our Facebook and Twitter accounts. Information on upcoming Community Conversations for 2018 is available here. For previous community events, see our archive. On April 27, 2018, HRC was honored to host a conversation with Dr. Cornel West at the Nourse Theater for the 25th anniversary of Dr. West's seminal work, Race Matters. 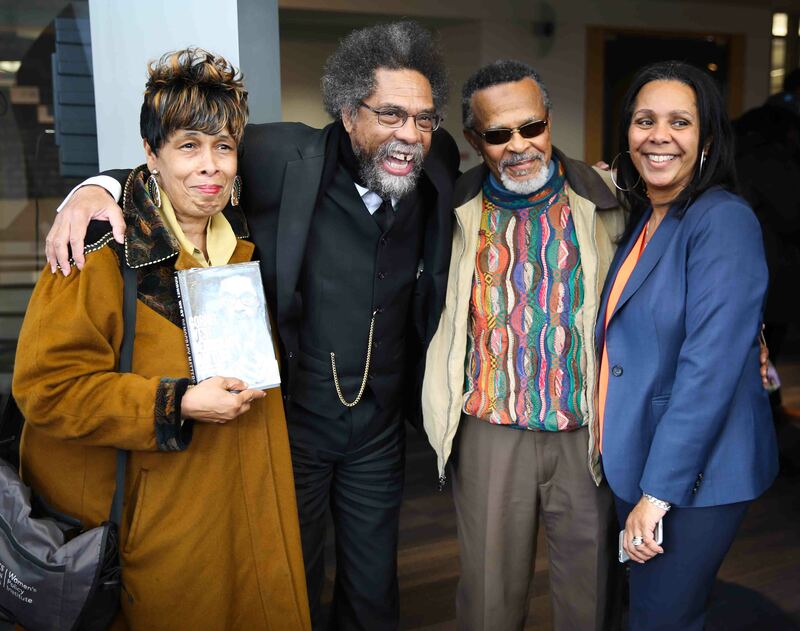 Dr. West delivered his masterful oratory and wisdom to a sold-out crowd of 1,600 community members, equity advocates, academics, government employees, and others. HRC Director Sheryl Davis introduced Dr. West and joined him after his own introduction for a moving discussion of current events followed by poignant questions from the audience. 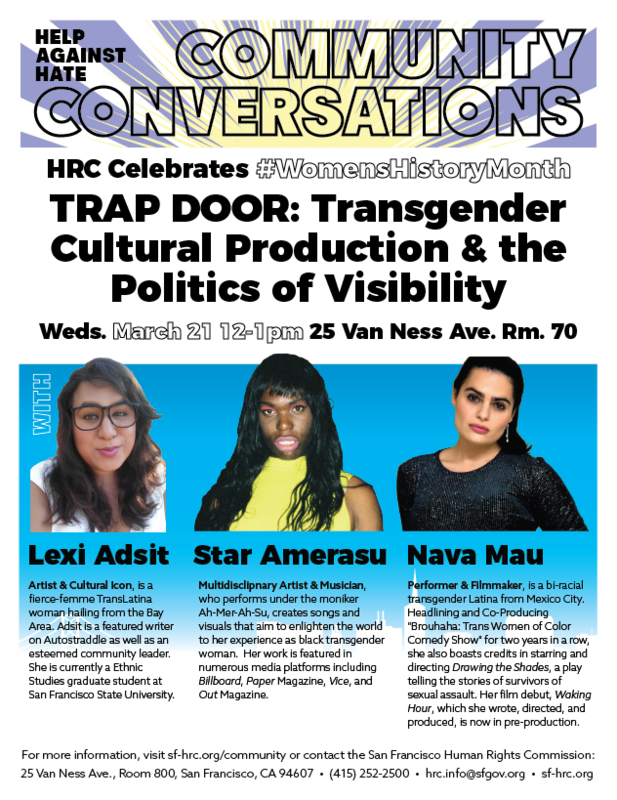 HRC LGBT Policy Advisor, Aria Sa'id, organized a special series of Community Conversations centered around women in social justice and movement building towards equity and equality, in honor of #WomensHerStory Month. More information here. 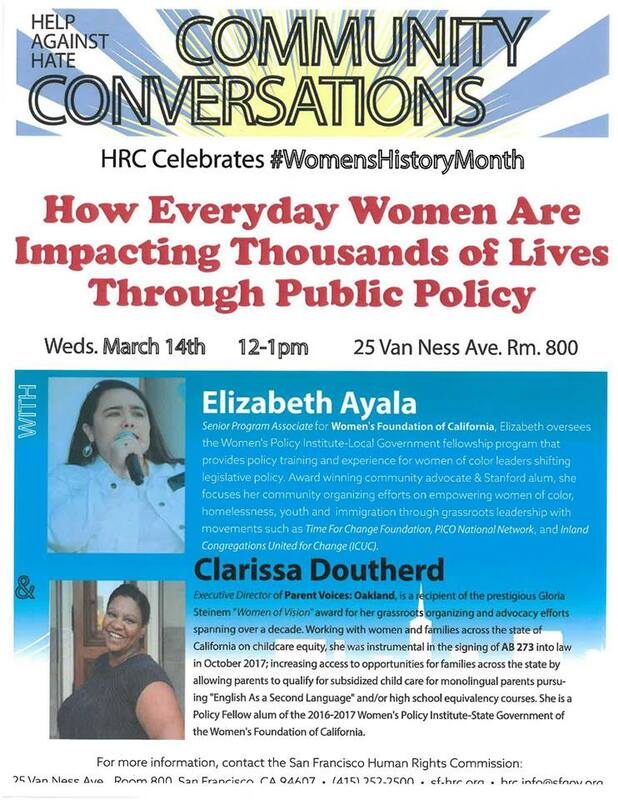 On March 6, 2018, HRC continued its speaker series with the San Francisco Alliance of My Brother and Sisters Keeper at the University of San Francisco entitled, "Power Concedes Nothing: A Woman’s Battle for Social Justice in America." The event featured an important discussion with Connie Rice, a renowned civil rights lawyer who has received more than 50 major awards for her leadership of diverse coalitions and non-traditional approaches to litigating major cases, involving police misconduct, employment discrimination, and fair public resource allocation. UniteSF, a program of the SF Chamber of Commerce Foundation, partnered with LinkedIn and the San Francisco Human Rights Commission to host an executive business briefing on My Brother and Sister’s Keeper in San Francisco. The goal of this briefing was to educate the business community about local efforts to close the achievement gap and highlight ways that businesses can support these efforts. HRC kicked off 2018 with a series of workshops to celebrate Black History Month at the African American Arts & Culture Complex (AAACC). 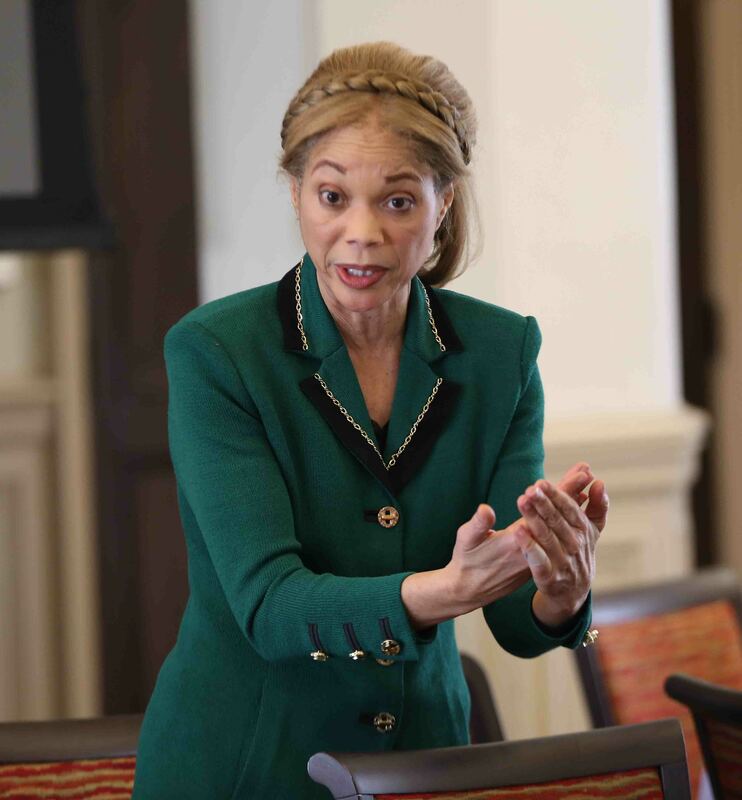 HRC Director Sheryl Davis led community members, youth, government officials, local students, and nonprofit employees in creative activities that highlighted Black history. 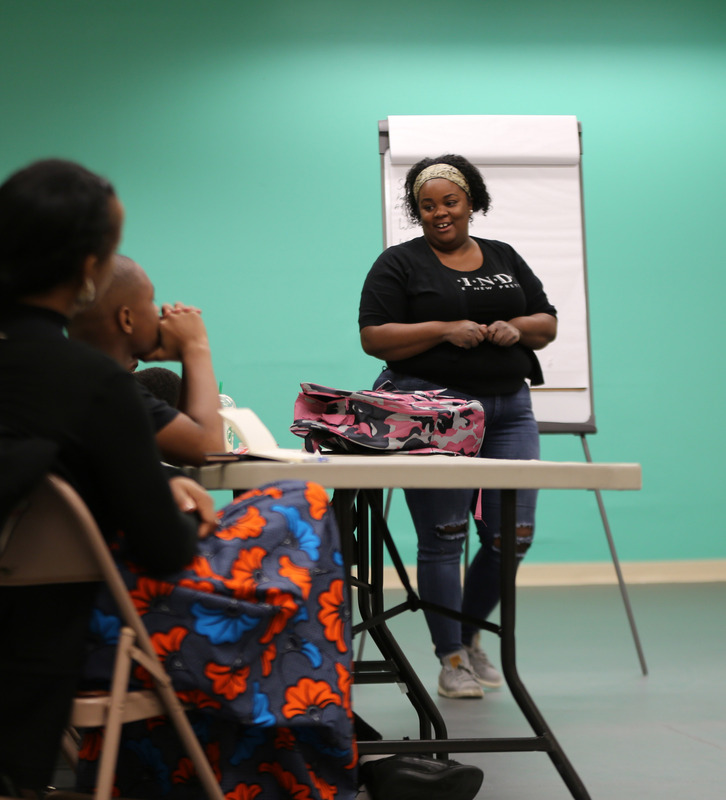 Participants made visual and spoken word art, short documentaries, and music responsive to Black history and equity in breakout sessions featuring the performer Sangin' Sara and local film company Citizen Film, among others. Their work was displayed at the end of the month in an art show at the AAACC. Citizen Film's documentary "Chop Shop: A Community & Law Enforcement Conversation" was also premiered. In December 2017, HRC launched a new speaker series to focus on themes relevant to the San Francisco Alliance of My Brother & Sister’s Keeper (MBSK). Lectures, to be held from December 2017 through April 2018, will feature thought leaders sharing their insights on current affairs and systemic institutional problems. To coincide with Human Rights Day and the 70th anniversary of the Universal Declaration of Human Rights, HRC kicked off the MBSK Speaker Series on December 10. 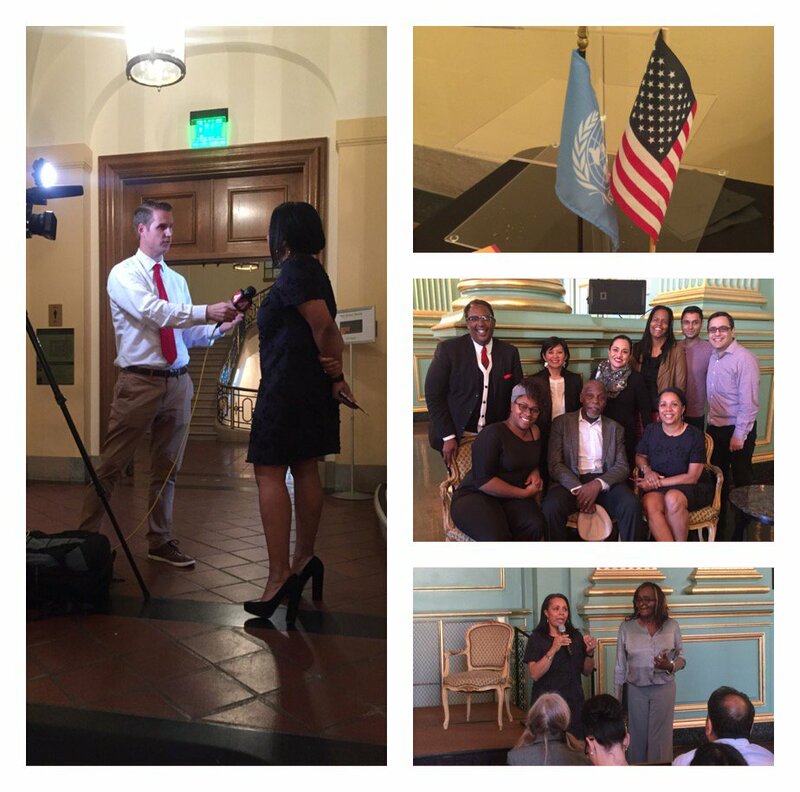 Event partners included the United Nations Association of the United States of America, LinkedIn, Collective Impact, San Francisco Public Utilities Commission, and Black to the Future. 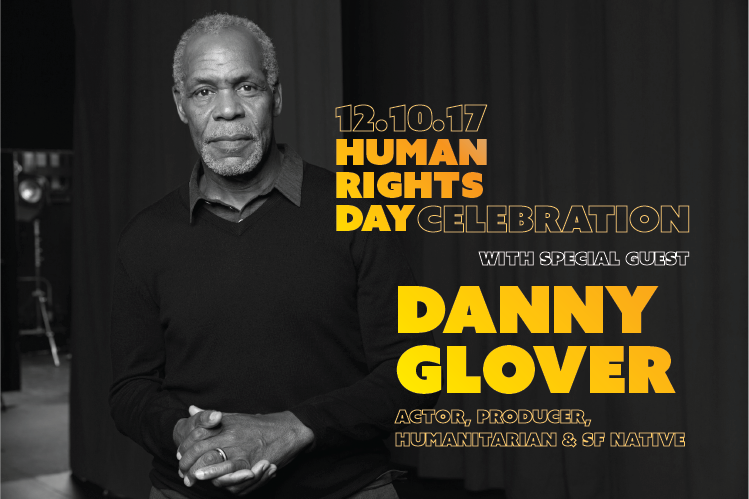 The event featured special guest Danny Glover, the actor, humanitarian, and San Francisco native who is well respected for his wide-reaching community activism and philanthropic efforts. An award ceremony was also held to celebrate local leaders’ contributions to human rights. HRC gave an award to Janetta Johnson, Executive Director of the Transgender, Gender Variant, and Intersex Justice Project, for her promotion and advancement of human rights for all people. In response to the White Supremacist rally planned for August 26, 2017, HRC developed an ongoing series of conversations about race, hate speech, and discrimination. 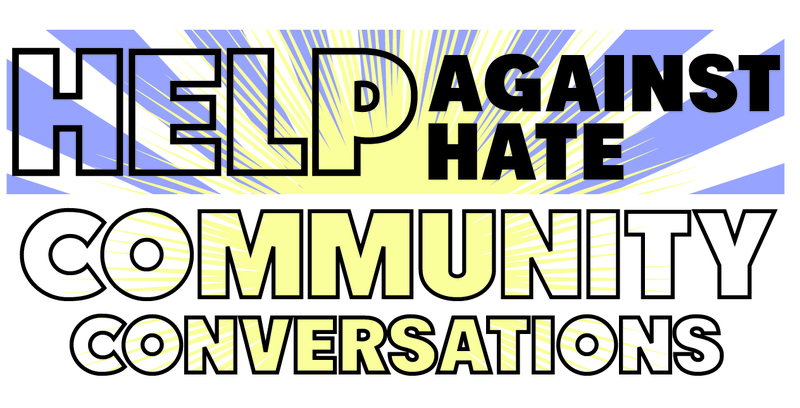 These “Community Conversations” are meant to inspire courageous dialogue on issues of equity and direct action in a healing space, with an opportunity for participants to express love and provide help against hate. 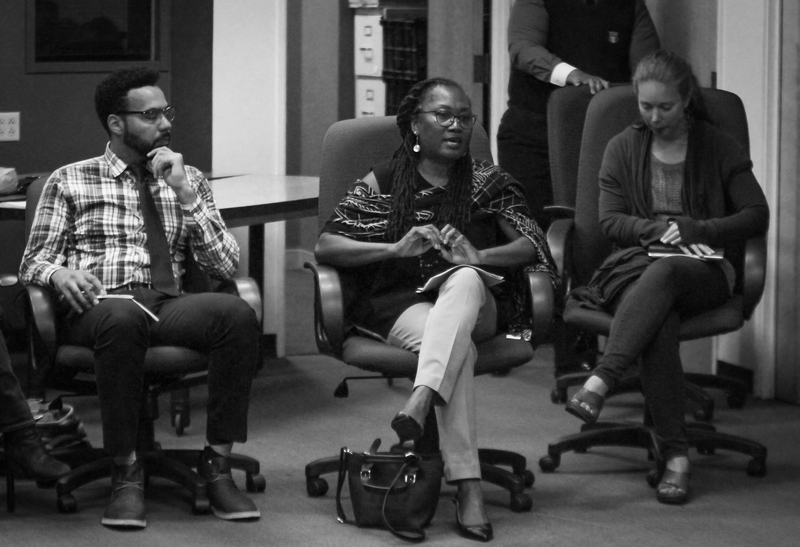 Community Conversations were held weekly for the remainder of the year and continue in 2018. For information on recent and upcoming Community Conversations, click here. HRC partnered with the Mayor’s office to promote two rallies in response to the White Supremacist rally planned for August 26, 2017. On Friday, August 25, 2017, a free “Unite Against Hate” rally was held at Civic Center Plaza. 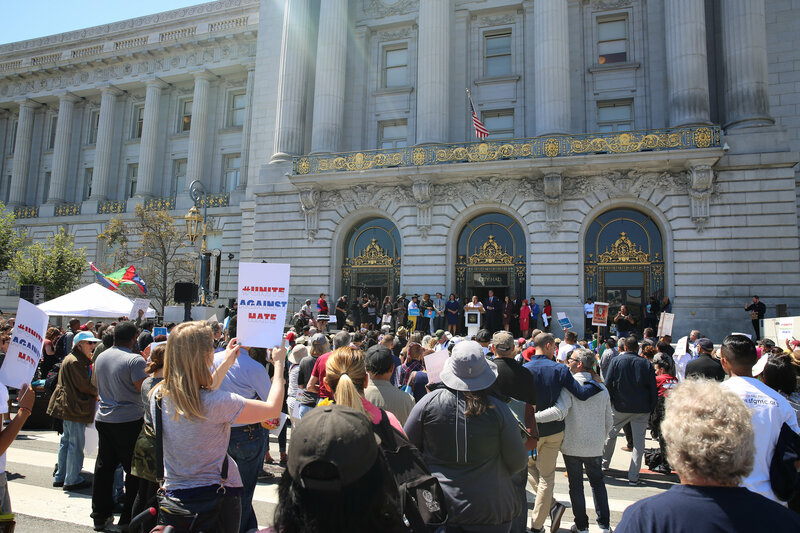 Community leaders, faith-based representatives, local labor members, and city officials energized hundreds of attendees, celebrating our San Francisco values of compassion, love, and inclusiveness. The rally rejected the racist rhetoric and violence from previous White Supremacist demonstrations, including in Charlottesville, Virginia on August 12, 2017 that left an anti-hate protester dead and dozens injured. Congresswoman Jackie Speier, Senator Scott Weiner, Board of Supervisors President London Breed, and Mayor Lee also spoke. HRC managed invitations and social media for the event and produced a variety of “Unite Against Hate” posters and tee shirts for participants. HRC’s work was featured on CNN and the HRC’s rally posters can still be seen in many business windows in the City, attesting to the slogan’s popularity. On August 26, 2017, a second rally was held, “Peace, Love, and Understanding: A Gathering Against Hate.” The free event also took place in Civic Center Plaza after a march from the Castro District involving thousands of people. Director Davis was one of the three keynote speakers for the rally, which also featured other local leaders as well as musical performances. 107 people signed into Help Against Hate Stations in total, and more were reached who did not sign in. At each station, participants were asked to write or draw messages of love and support on a scroll of paper. They received HRC’s “Respect & Love Toolkits” as well as “Help Against Hate” resource cards in multiple languages and additional information on the HRC’s initiatives and investigative processes. Participants also received children’s books with messages of empowerment and love by or about people of color. The Stations dovetailed with existing programming or additional programming to enhance HRC’s message and participant experiences. 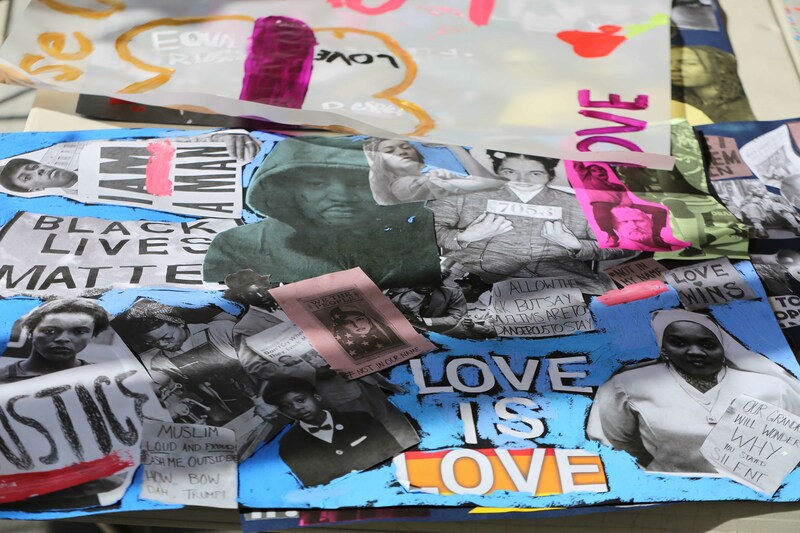 For example, Stations at the Museum of the African Diaspora and SOMArts were chosen to coincide with empowering art exhibitions such as “The Black Woman is God: Divine Revolution.” At the Musuem of African Diaspora, a robust and diverse turnout of children, tourists, and community members participated in the creation of mutiple pieces of artwork centered around love and peace. Coleman Advocates for Children and Youth was also a Station partner. Parents, youth, guardians, and volunteers all created bilingual messages of love, unity and peace. Multiple generations of families drew, wrote, and created with each other. Some guardians did not know how to read, but that did not stop them from proudly drawing and creating messages of love with their children. Coleman Staff also took time to create their own messages. While some messages took a political stance against Trump's messages of hate, other images included messages with hearts and pride in diversity. As attendees left the Station they expressed their gratitude for the time and space to build with others and address hate in this way.